Yesterday we had our 3rd Mix It Up Day for the school year. I posted previously about our second program in this post (What You Do Matters). I have been working really hard this year on our new theme, What You Do Matters!, but I really wanted kids to understand that they really hold a lot of control in different situations. 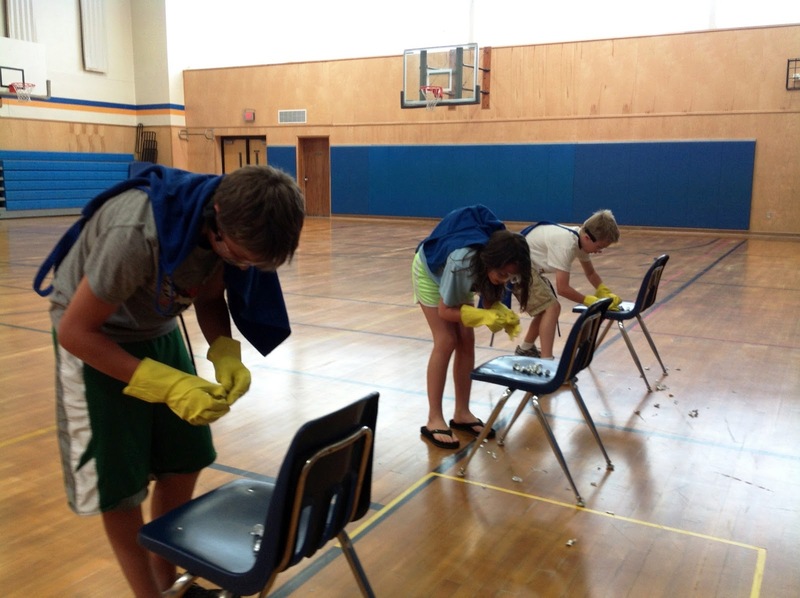 I decided to give the students a challenge: a simple relay race. I collected materials from around the school: chairs, cones, goggles, aprons, and dish-washing gloves. I also made a short little "Lunch Survey" that they could fill out and talk about while they were eating, and bought some Hershey Kisses. At our Middle School we have four lunch periods, one for each grade level (grades 5-8). Students are broken down into two groups: cafeteria and recess. Halfway through the period they switch, allowing each group to play and have lunch. For our first two Mix It Up Days, I broke away from this tradition, and had everyone in the grade eat together and participate in the activity. It was a challenge making sure everyone had enough time to eat, so this time, I thought I would keep the same format, but mix up the groups (keeps eat and play together with the same students all year). To do this I made 12 teams for each Grade Level. Each team was a color. I also made cards for each student that told them what team they were on and if their team ate first or had recess first. I did laminate these cards so I could reuse them for each Lunch. I also made signs for the table and signs for the relay race lines. This worked out really well, and I know I am going to save them and reuse them again next year. When the kids were in recess I lined them up for the relay race. On one side of the gym I had a cone for the starting point, the goggles, the gloves, and the apron (or superhero cape as many wore it). On the other side of the gym I sat chairs across from the cones, each with a stack of Hershey Kisses on them. 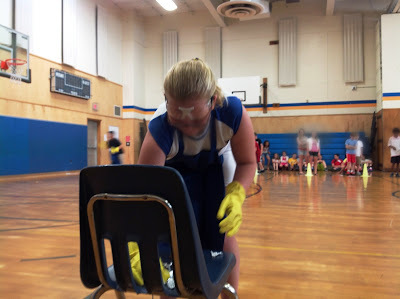 The students were asked to dress up, run over to the Hershey Kiss, unwrap it (while wearing the gloves), then either eat it or leave it on the chair (their choice), run back and switch with the next person in line. It was pretty comical watching the kids unwrap their Kiss with the gloves on, watching the goggles fall down their face, and seeing little pieces of Hershey Kiss paper hanging out of some mouths! How many thought this was difficult? Would the race have been easier if I didn't have them dress up or wear gloves? What message do I want them to walk away with? I then followed up with the message~ Sometimes we will encounter challenges in life. That doesn't mean we throw our hands up and give up. Things may, at times, seem difficult. However, if we don't accept the challenge and try new things, we may never know of the fun we are going to miss or the sweet reward we may find at the end. Hummm. . .see how it all ties together? Anyway, with the 8th graders we then talked about how in high school they will find plenty of experiences that may be challenging. . .classes, new friends, clubs, etc. The other grade levels we related it to bullying and what we can do if we see it happen, how the challenge is to intervene and tell someone to stop, but the reward is a safe school--one where learning is fun and everyone wants to be. What life lessons do you teach? Let me know by leaving a comment below. Just curious what program are you using to write up your slips? They are so fun looking and way better than my microsoft word designs lol.